Configure your partner OAuth application. Request an access token so you can access account details on behalf of your customer. Log in to the web application that corresponds to the product you’re integrating into your application. The My Partner Applications section on the right lists your partner OAuth applications. 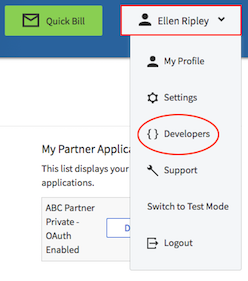 Locate the partner OAuth application that corresponds to your application and click Edit. Note: If you don’t see any partner OAuth applications, ask AffiniPay Support to create one for you. Set the application name. This is the name your customers see when they authorize your partner OAuth application to interact with their AffiniPay, LawPay, or CPACharge account. Ensure that OAuth Enabled is selected. OAuth is required for all integrations. Do not uncheck this checkbox. Set the Redirect URI. Per the OAuth 2.0 specification, the Redirect URI is the URI to which the AffiniPay, LawPay, or CPACharge web application will redirect after successful authorization. Your web server must handle redirects to this URI. In your application, a user (who is an AffiniPay, LawPay, or CPACharge merchant) clicks a Connect button. The user’s browser is redirected to a page that prompts the user to give your application access to the user's AffiniPay, LawPay, or CPACharge merchant account. After your application is granted access, the user's browser is redirected to your web server, with a URL that includes an authorization code. Your application requests an access token in exchange for the authorization code. Your application receives an access token. 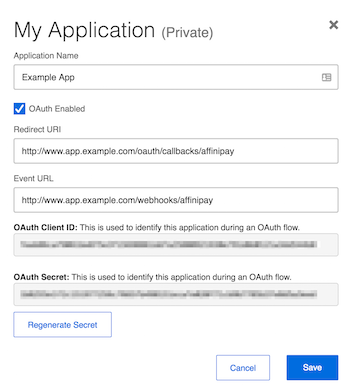 Your OAuth client library will help you run the OAuth flows. Use the logo that corresponds to the AffiniPay payment solution you’ve integrated with your application. Click here to download our logos. Scale buttons and logos to meet your size requirements, but make sure the aspect ratio is locked to prevent stretching or otherwise distorting the logo. “Connect with” text. Use the text “Connect with…” and append it with “AffiniPay”, “LawPay”, or “CPACharge”. Your client OAuth library should provide a convenient method for initiating the authorization code flow. redirect_uri is the redirect URI you set in your partner OAuth application. client_id is the OAuth Client ID from your partner OAuth application. Note: This example is for connecting with AffiniPay. To connect with LawPay or CPACharge, be sure to use the correct authorization redirects URL in the request. The AffiniPay, LawPay, or CPACharge web application will respond by redirecting first to the AffiniPay, LawPay, or CPACharge login screen to authenticate the merchant and solicit their permission to grant you access to their account. Following successful authentication and customer approval for access, the AffiniPay, LawPay, or CPACharge web application will redirect to the specified redirect URL with an OAuth2 authorization code. The URL will be formatted as <partner-redirect-url>?code=<authorization-code>. After the user logs in through AffiniPay, LawPay, or CPACharge and authorizes your partner OAuth application, the Authentication API sends an authorization_code to the Redirect URI you specified in your partner OAuth application in the following format: <partner-redirect-url>?code=<authorization-code>. You must configure your server to listen for this authorization code. client_secret is OAuth Secret from your partner OAuth application. code is the authorization code that was returned. Next, you’ll create a Quick Bill.